Can the job be real? I saw an advertisement on Facebook that said I could stand a chance of being selected at random to go for training and work for a website. They said that no experience and qualification was need and that we just must be fluent in Setswana or English. The advertisement said that after training they would pay salaries of P7,000 per month and also bonuses and allowances. 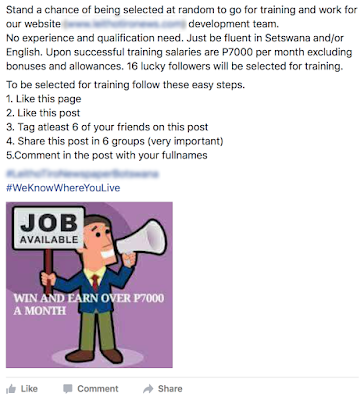 They said that only 16 lucky followers will be selected for training. I’m very sceptical about this. Firstly, real companies don’t recruit people at random like this. Real companies also don’t recruit people based who have “no experience and qualification”. Yes, of course come companies like to recruit people who are new and who can be trained but they only do that once they’ve been thoroughly assessed. The post gives a web site for what they suggest is an online newspaper but that the web site doesn’t actually exist. I also disapprove of the way they’re undertaking this supposed recruitment exercise. They say that to be selected for training recruits must follow several steps. Firstly, you must like their Facebook page, then like the post advertising the supposed recruitment, then tag at least six friends and then (and they say this is very important) share the post in six other Facebook groups. I suspect that these people are spamming Facebook with garbage in the hope of popularizing their so-called news site. There might be nothing more to this than that. We all need to be very careful with any advertisements for jobs that we see online. This one is irritating but harmless but many others are the beginning of advance fee scams. They’ll claim they’re finding you a job in a far-flung, exotic location with an amazing salary and astounding benefits but in fact there’s no such job at all. Just before you think you’re finally getting the job they’ll spring a surprise on you, a legal or visa fee that you’ll have to pay them or one of their associates in order to get the job. That’s the “advance fee” they’re seeking. Remember to be careful, particularly when something seems too good to be true. It always is. Can I get my laptop fixed? I need your advice. Ever since I bought my laptop at a store in Riverwalk last year September it has been giving me sound problems. It had a year warranty and I took it back 3 times to have it fixed within the year long warranty period. They said they only exchange if its to be fixed for the 4th time...now the thing is the same sound problems have started again but now the warranty period is over. It seems like my laptop is still having the same problem it always had from the beginning. Should i take it back again or give up coz my warranty is over? No, you must NOT give up. Clearly this laptop has a major problem. You should tolerate a problem like this once but three times is going too far. Also the store’s excuse about only exchanging it if it goes wrong four times is just silly. There is obviously a problem that they can’t fix and the time has come to offer you a replacement laptop. This is an area where we’re lagging behind other countries. In 2015 the UK updated their consumer protection laws to guarantee a right to completely reject an item and get a complete refund if it fails within the first 30 days. After 30 days you have to give the retailer one chance to either repair or replace the item but after that you can insist on either a repair or a replacement. Their new laws have had a dramatic effect on the way stores in the UK treat their customers. Don’t you think we deserve the same level of protection? I know that in your case the warranty period has expired but I still think the store has a moral obligation to help you somehow. They’ve had three opportunities to fix the thing and have failed each time. That’s simply not good enough. We’ve already contacted the store manager and he’s promised to look into your situation. I suspect they’ll do the decent thing.